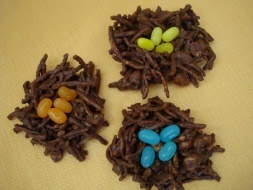 These Mini Bird Nests are an easy edible spring craft for preschoolers, on up! This is a perfect treat for the kids to make for Easter or spring, and would also works great as a party favor! 1. Melt your chocolate chips in a double boiler or large sauce pan. Sir in noodles, peanuts and coconut until they are coated with chocolate. Drop HEAPING spoonfuls of the mixture onto wax paper, about 3 - 4 inches in diameter. 2. With a spoon, hollow out the middle of each nest. Younger children may find it easier to make these holes with a finger or two wrapped with plastic wrap or wax paper. 3. Place your jelly bean eggs inside the nest. 4. Leave your nests out to set, after which you can eat them, or store them in the fridge for later! *If you are using a regular sauce pan it's important to remove the pan from heat as soon as all the chips are melted. This way the chocolate won't "cook" and get really hard. We used Jelly beans, you can use any egg-type candy, try the mini Cadbury eggs, or foil-wrapped eggs. If you are going to give your nests away, wrap them in a cute treat bag and tie with a Spring ribbon!